Cress is a tasteful vegetable which is known for its nutrition and the health benefits it offers. It may be consumed in both raw as well as cooked form and the number of calories you take in are largely dependent upon its form. One cup of raw cress weighing around 50 grams contains 16 calories of which 3 calories are obtained from fat. The total fat content in an equal quantity of raw cress is 0.3 gram consisting 0.1 gram each of polyunsaturated and monounsaturated fat content. The total sodium content in it is 7 mg, carbohydrate content is 2.8 grams, dietary fiber content is 0.6 gram, sugar content is 2.2 grams and protein content is 1.3 grams. 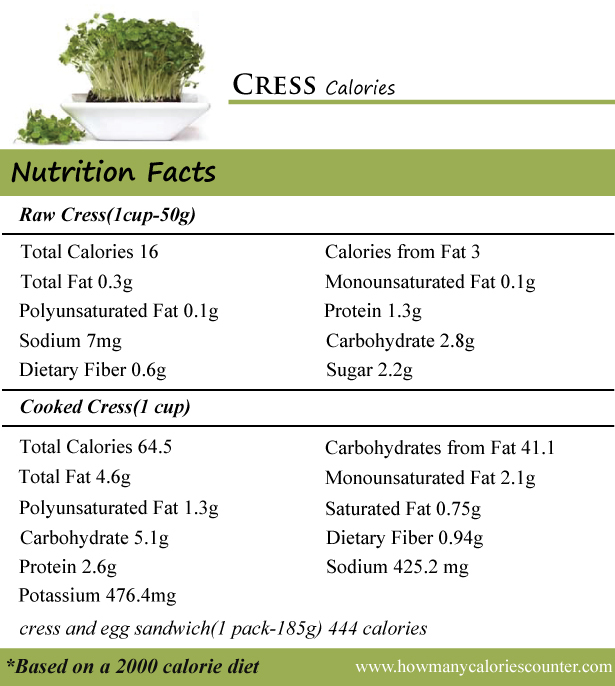 One cup of cooked cress contains 64.5 calories of which 41.1 calories are obtained from fat. The total fat content in it is 4.6 grams consisting of 2.1 grams monounsaturated fat content, 1.3 grams of polyunsaturated fat content and 0.75 gram of saturated fat content. It has a total carbohydrate content of 5.1 gram, dietary fiber content of 0.94 gram, protein content of 2.6 gram, sodium content of 425.2 mg and potassium content of 476.4 mg. However, cress can be cooked using different methods and the calorie content in this vegetable is dependent to some extent on its method of preparation. Adding more spices and oil to cress increases the calorie content in it. Cress is a rich source of vitamin A, good source of vitamin C and contains some amount of various other vitamins. It also contains various other minerals including phosphorus, magnesium, calcium, iron and copper. Cress and egg sandwich is a popular cress preparation which is quite delicious. However it also comes with a number of calories. One pack of cress and egg sandwich weighing around 185 grams contains 444 calories out of which 233 calories are obtained from fat.